Love the Tau. Something about the Tau aesthetic has always struck a chord with me. 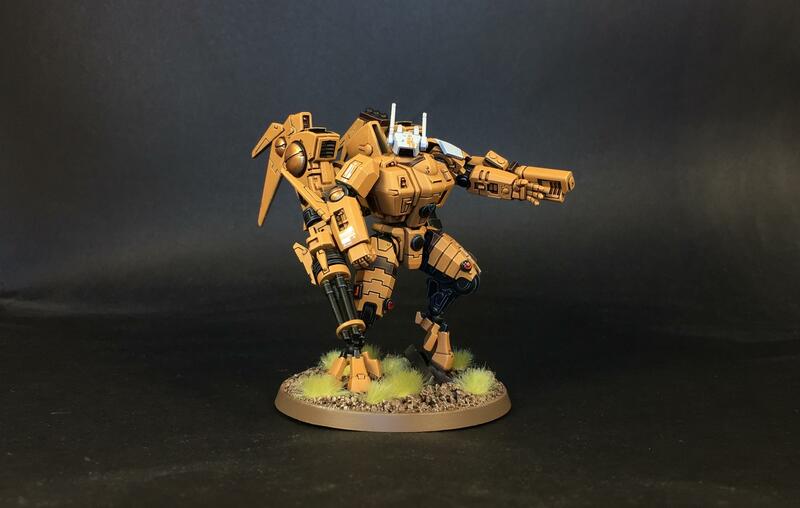 A foot slogging firewarrior based army was always the plan back when I started my now abandoned tau force. Yours look unsurprisingly fantastic though. The Shas'ui's expression is great. He's seen something and he's not well pleased about it. Agreed with Nev on the weathering. they look great nice and clean, but a little bit of battle damage would look killer. Some sucking chest wounds always look good on Tau. But great painting, mate! Even those blue ones look very very good. Blue... what an odd colour for a Space Marine, what else will they come up with these days..? It's been a pleasure following your Ultras, but these recent Tau are really inspring (and Tau are my thing these days). Especially nice to see a XV15 in classic Y2K studio colours! Sharp as always, and a great homage to classic Tau. I know I'll miss the inspiration from your work while you're away. Enjoy the trip! Damn, that's cool. Super crisp, very faithful colours, great detail work. A top quality mini to round out the year. I'm leaving the country next Tuesday for an Honours Classical Studies field trip to Greece for two months, which is super exciting, but I'll be away from the paint desk. As reasons not to be at the desk go, that's one of the cooler ones! I'm on a massive ancient Greek kick at the minute (well, even moreso than usual, at any rate) on account of the new Assassin's Creed being set there, so I'm ever-so-slightly jealous of that trip! How hard would it be to stash a brush and a few pots of paint in your luggage? Really, excuses excuses! 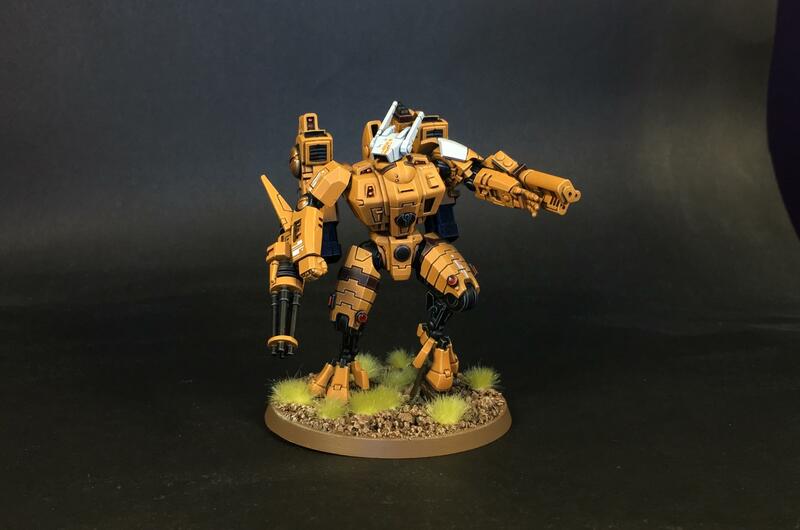 Your hard work on the tau paid off, he looks awesome. Enjoy your trip, and see you next year! Awesome suit! Good luck on your travels. Best of luck on your trip to Greece! Honestly blown away by that Battlesuit, amazing work! Hey everyone! I am back from my holiday at last. 2019 is going to be a primaris year for me. And a heavily Ultramarine one! I have returned with a colossal yield of less expensive overseas boxes (add the interdiction force to the picture of the goodies and that's my total sum!). 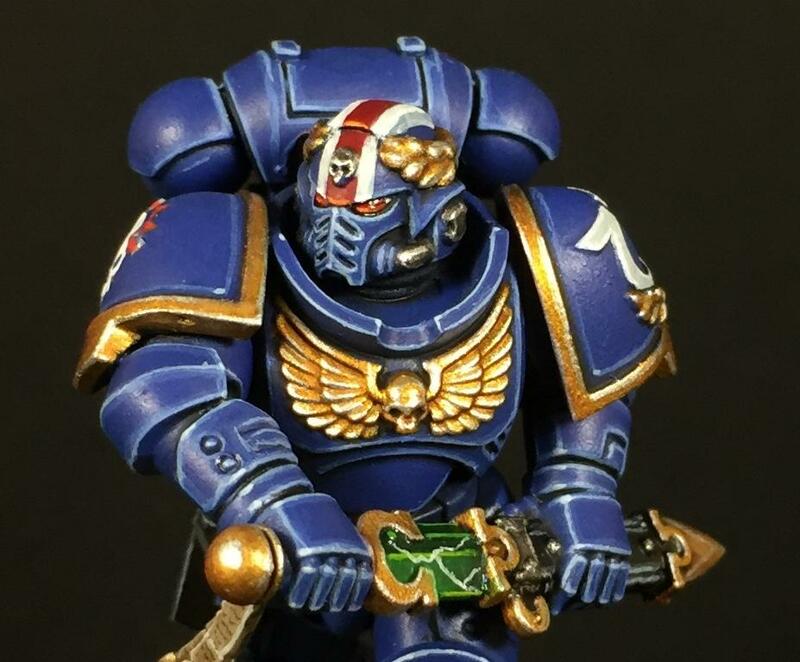 I'm going to aspire to paint up ~3000 points of Ultrasmurf primaris goodness, with the occasional captain in there to detox and keep myself sane (this far into a captain addiction, I'm realistic about what my needs are). I'm in between flats right now so I can't set up a full version of my paint desk, so I've just been doing some assemblies. I'll show you what I started with Looking forward to dusting off the blog and getting it up and running again! As always, looking foreword to what you end up working on. Those two guys are looking like a great start! Welcome back. This is gonna be awesome! Great to have you back, hope you had a good time in Greece! Ah back to normality, and that is some collection of beautiful kits. Nice to see you will be returning to some serious smurf action. Wow. New year, new marines, new cool paintjobs in the offing. Looking forward to all of it. Oh wow, you brought up large! Subject: LDP's Blog: 25th Jan - The fast, steady return?! Lt. Calsius done! Thanks for the warm welcome everybody. I love this forum and you guys are the key reason! Such a great, tight-knit community. So! It's surprising how much painting you can do when you're in between flats (especially since nothing is set up except for a really rudimentary version of my painting desk ). Accordingly, I finished Calsius over more or less two sessions! I'm really pleased overall - the first ~1 hour or so session was quite rusty and felt odd, but I got back into the swing quick fast and am looking forward to new projects! I'm going to paint a single primaris intercessor, just to double down on returning to form, as well as having a partner to submit into Para's monthly comp that'll be easily painted up within the next few days. Anyway, enjoy the pics! That's ace. Love the helmet markings and the checked kneepad. This is you working in adverse conditions while rusty? Amazing work. Where is that guy from, a/o what bits did you use to build him? And we're off! Great stuff. The eyes...so good. Super awesome stuff. I hope they release Conquest in germany soon. I can admire your Lt. Calsius in the meantime! 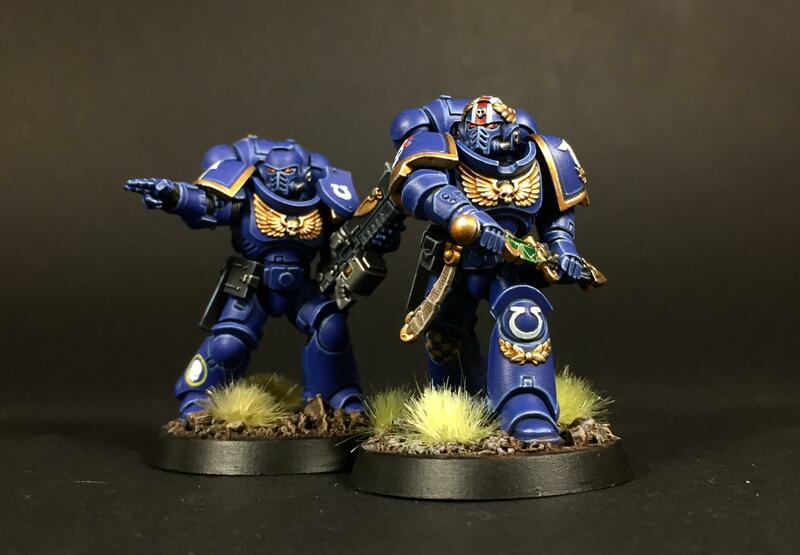 That's some 'Eavy Metal level painting on that lieutenant! I like the old school checkers on his knee, and I think the orientation of the head looks way better than on the official model. I got to say though, I think that those tufts are letting your work down slightly. They're a bit too neon, and look flat being just one color. Subject: Re:LDP's Blog: 25th Jan - The fast, steady return?! Lt. Calsius done! Some excellent painting all over this thread! Really liked your kill teams. I especially just loved the wooden stock on that one guardsman. So simple yet effective. I might have to borrow that one! Will browse through the earlier pages one by one when I get the chance! @Neve The miniature is Lt. Calsius from the warhammer conquest range. I had to get him on ebay. 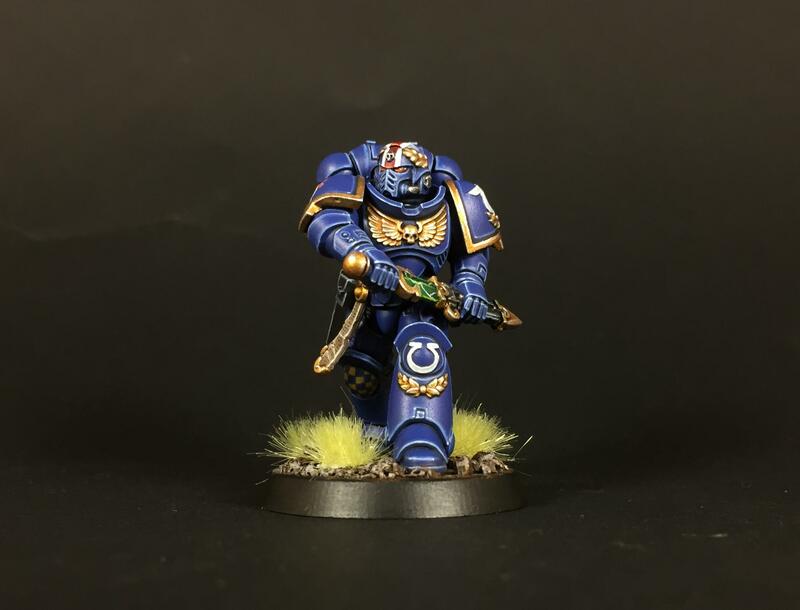 But yes - the Ultramarines do have a custom Lieutenant! @mcmattila thanks for the feedback As far as the tufts go, they do the job I think. I agree that the single colour is a bit plain, but it conforms to the relatively simple basing style that my ultramarine army has (plus it'd be a lot of work to uniformly change my basing style now!) - The neon look is dramatised as well by my lightbox I think. It's a little more palatable irl. Just finished an intercessor for the monthly comp/to trial a factory lining paint scheme that should help me finish mass infantry a little faster than usual, without sacrificing too much in the way of quality. Calcius and his intercessor buddy are both looking stunning as per! I really like that their heads are inclined in the same direction and it gives a nice uniform feel! 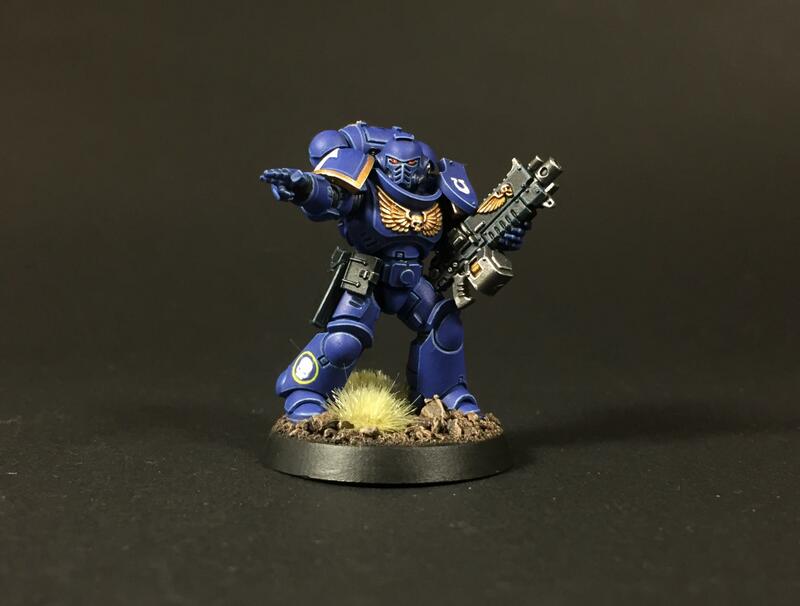 Intercessor: Hey, Calsius. That heretic said something bad about your mom. And the Emperor.